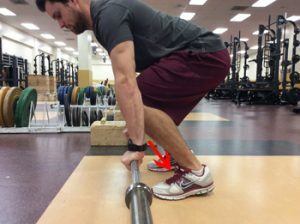 Do you utilize Olympic movements in your strength and conditioning program. There is no doubt these exercises are beneficial, but are the worth the risk. In this post learn how to teach an efficient first pull. Many high school programs are using the Olympic movements in their daily programming. The debate on whether it is the best way to train high school athletes–is the risk worth the reward–will probably go on for the rest of time. I won’t go into the debate here because I believe that utilizing these movements is beneficial. However, if you do not have the knowledge base to teach proper positions and progressions or spot technique flaws (or if you don’t have the time, space, or equipment), there are other options. If you chose to utilize the Olympic lifts as part of the training program, at some point you will witness a poor set up and an inefficient first pull. This will happen regardless of their training level. As a coach, it’s important to remember when teaching these lifts that, just like with so many movements in sport, the devil is in the details. The most common mistakes I have witnessed in my athletes in their set up is that they are either too far off the bar at the start or too far back on the bar. 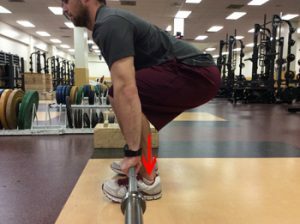 In both instances they have improper weight distribution in the feet at the beginning of the first pull, which will cause the athlete to move the bar around the body, and not the body around the bar. Both of these set up mistakes will force the bar to move around their body (knee), instead of moving vertically next to the body. Doug Bull, MS, CSCS, is starting his 11th year as Strength and Conditioning Coordinator for the Deer Park (Texas) School District. He has more than 20 years of strength and conditioning experience ranging from junior high school to NCAA Division I athletics, including coaching stops at Northern State, Fort Hays State, Illinois State, and The United States Naval Academy. He is nationally recognized for the work he has done to promote training secondary athletes and has served as a consultant in the creation of over a dozen full time strength positions nationwide. His web site is: www.dpstrength.com.